In this Community Knowledge Alliance (CKA) event, a group engaged in sexual assault issues on campus will provoke us to think meaningfully about what can be done, not just on campus, but collectively among campuses and community organizations. Attention to sexual assault on university campuses has renewed over the last two years, inspired by a rise in reported assaults, increased complaints, court cases and survivor protest and performance art on campuses such as Queen’s University, University of Saskatchewan, and Columbia University, among others. There is a rising collective movement driven by student unions to address sexual violence on university campuses, and university administrations’ barely visible responses to these growing concerns have been front page news in Canadian newspapers. The consensus across campuses is that victims feel abandoned by the universities they attend when sexual assault occurs. While therapeutic, gender and safety offices abound on university campuses, they seem not to be effective enough resources for students. 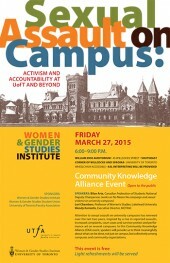 Sponsored by WGSI, WGSSU and the University of Toronto Faculty Association.